Give the gift of security this holiday season. For the executive who has everything, giving the gift of door security this holiday season is in the top ten tech gifts for executives. The Schlage NDE electronic and wireless lock’s sleek design adds door security and privacy for use in attorney’s offices, doctor’s offices, bars and restaurants, small business offices and for leased real estate office space where electronic audit trails and proximity readers can make entry easy for those with credentials, and also lets you keep track of who is entering each room, when it is entered and where a credential used. CALL 800 480 6613 NOW TO GET A QUOTE! 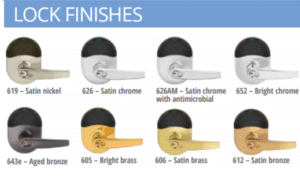 The Schlage NDE wireless electronic lock with mobile app comes in Satin nickel, Satin Chrome, Satin Chrome with antimicrobial, Bright Chrome, Aged Bronze, Bright Brass, Satin Brass, and Satin Bronze.